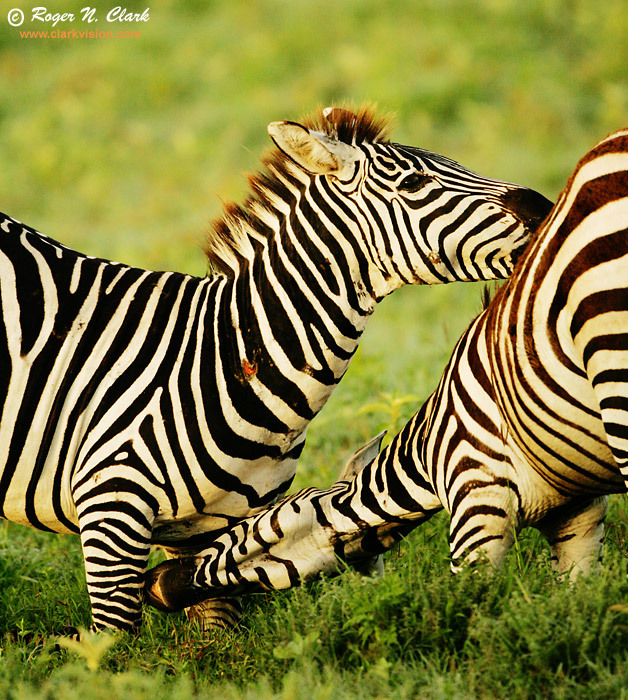 These two male zebras were fighting for dominance, at sunrise. Note the bite on the neck of the zebra on the left. He also has taken quite a beating as seen by his other scars, and he is the dominant male. The challenger did not succeed. Ngorongoro Crater, Tanzania, Africa. Technical: Canon 1D Mark II 8-megapixel camera, Canon 500 mm f/4 L IS lens. Exposure: 1/1600 second at ISO 800, f/4. Full image width, verticle crop.